The concept of atomic absorption spectroscopy (AAS) came to CSIRO scientist Alan Walsh in a flash of inspiration as he was gardening at his Melbourne home. This led to an invention that has since been labelled as one of the most significant achievements in chemical analysis last century. AAS allows the measurement of extremely small amounts of elements and is routinely used in medicine, manufacturing, mining, environmental monitoring and laboratories throughout the world. Not only has AAS saved lives and made industry more efficient, but the commercialisation of this technology led to the birth of the scientific instrument industry in Australia ‘ an industry worth more than $1 billion a year today. For years Alan Walsh, a tall and wiry Lancashire-born physicist of oceanic moods, had weathered despair in trying to find an answer to a problem that had defeated other scientists since the last century. It was the problem of how small concentrations of metallic elements could be measured more exactly by spectroscopy. The normal procedure in spectroscopy was to vaporize an element and measure the energy emitted as light by its excited atoms. On a Sunday morning in March 1952, Walsh was working off his frustration in the garden of his home in the Melbourne bayside suburb of Brighton. Suddenly in one revealing flash of thought, something that he was never able to rationalize later, he had the answer. He hurried inside, dirt still on his shoes, and phoned his working colleague John Shelton. Look, John! he exulted. We’ve been measuring the wrong bloody thing! We should be measuring absorption, not emission! Early on Monday morning he set up a simple experiment, using the element sodium, in his laboratory at the Division of Chemical Physics. By morning-tea time he had a successful resultâ€”the basis of what has been called the most significant advance in chemical analysis of the 20th century. In purely scientific terms it was a remarkable achievement. In subsequent practical use its value has been beyond measure. It saved the life of a young boy who went into violent convulsions after being admitted to a Sydney hospital with severe burns. Atomic absorption tests showed the boy had suffered a critical loss of magnesium. Given doses of that element, he recovered. His photograph had a special place in Walsh’s office. Other atomic absorption tests solved the riddle of the crazed Minamata cats which were diving into the sea off Japan. The discovery that they had eaten mercury-polluted fish saved thousands of people from crippling illness and death. Similar tests explained the soaring delinquency rate in Sudbury, Ontario, revealing that a lead-smelting plant was contaminating the town. Atomic absorption has detected tainted baked beans during canning and helped find huge mineral deposits in Western Australia. And yet Walsh’s flash of inspiration was not an end but a beginning, of countless hours at his laboratory bench and then years during which he had periods of deep despondency as his discovery met almost universal indifference. The head of a big American corporation once challenged him, ? ?If this goddam technique is as useful as you say it is, why isn’t it being used right here in the United States? ?? Walsh sharply retorted that in many ways America was an underdeveloped country. Now the corporation is the world’s largest manufacturer of atomic absorption equipment. The previous method of flame emission spectroscopy detected only seven or eight elements with the light given off by atoms when they were excited in a flame. But even in the hottest laboratory flames only very few atoms reach this excited state. On the other hand, all atoms in their normal state are capable of absorbing light until they reach an excited state and so a measurement of their light-absorbing capacity is generally much more sensitive. With this in mind Walsh built his device which had a bunsen-type flame to produce atomic vapours from the sample solution. In order to measure the concentration of a particular element in the material, say sodium, he placed a sodium lamp operating from a.c. frequency on one side of the flame. On the other side he placed a filter which picked up only that particular sodium light frequency. It was linked to a highly selective photocell receiver which passed the selected frequency on to an amplifier. This amplified only the a.c. frequency and ignored any direct d.c. sodium light. Put to work, the device measured the amount of a.c. light from the sodium lamp that was absorbed by the sodium atoms in the flame while rejecting the d.c. light they put out directly. He and his fellow workers subsequently developed a wide range of improvements in the flames and atomic spectral lamps that are key components in atomic absorption spectrometers. Another refinement was a discharge lamp that could be used as a detector, doing away with the need for a monochromator. Their invention of a sputtering chamber did away with the need to dissolve the samples for analysis ‘ solid samples could now be used direct. By the time the original patents of atomic absorption had expired around 1969, twenty licences had been issued, and there were also several manufacturers in countries such as Japan in which patents had not been sought. During 1963-67 sales of atomic absorption instruments experienced exponential-like growth. By 1969 there were more than 10&nbbsp;000 atomic absorption spectrophotometers in use in hospitals, factories and laboratories around the world, and by 1977 this number had grown to around 40 000. Alan tells how a slight decrease in the rate of world sales around 1968 came as a relief to his colleague, John Willis, who feared that if sales continued to increase at the same rate as 1963-68, then by the turn of the century the whole surface of the Earth would be covered by atomic absorption spectrophotometers. Walsh’s months of frustration and years of hard work have paid off handsomely. More than tens of thousands of atomic absorption instruments are now in use in hospitals, factories and laboratories around the world measuring traces of metallic elements in a whole range of substances as diverse as soil, blood, urine, plant leaves, minerals, wine and engine oil. The current world market for atomic absorption instruments is around A$300 million a year. Varian Australia Pty Ltd in Melbourne, with a staff of around 400 and a similar number outside the company engaged in contract work, has the second largest share of the market, after the Perkin-Elmer Corporation, while GBC Scientific Equipment Pty Ltd in Melbourne, with a staff of around 180, is the third largest. In addition, Photron Pty Ltd in Melbourne manufactures hollow-cathode lamps and high-intensity hollow-cathode lamps for atomic absorption. The commercialisation of the atomic absorption spectrophotometer essentially led to the birth of the scientific instrument industry in Australia. 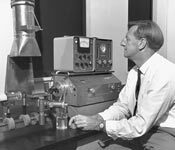 In 1968, AW Brown, a scientist with postgraduate qualifications in business administration, was recruited by John Shelton at CSIRO Head Office to conduct a detailed cost-benefit analysis of the atomic absorption project. This study conservatively assessed the value of the net benefits to the Australian economy at around $22 million (in 1968 Australian dollars), compared with $1.3 million originally spent on the research. (Later estimates gave the accumulated benefit to Australia by the year 1977 as in excess of $200 million, including overseas royalties, the setting up of new industry, and the productivity increases in a wide range of enterprises.) Much to the surprise of many, Brown found that the major benefits to the economy were not through the manufacture of atomic absorption equipment in Australia but rather through benefits to the user, that is, benefits associated with productivity gains, especially the ability to perform large numbers of assays very rapidly and with a high order of accuracy. This component far outweighed the benefits of manufacture. Royalty income was miniscule by comparison. Well, of course it was fortunate. We say it was good planning! I think it’s a good example of how uncommitted research can finally be more significant than directly applied work. If somebody had said in 1950 that there was going to be a mineral boom in ten years’ time which would need new methods of analysis, I’m sure we would have tried to elaborate existing methods, rather than follow a completely new line. There are two important lessons to be learned from this account of the development of atomic absorption methods and the difficulties encountered in convincing analysts and scientific instrument manufacturers of their potential. First, it should be noted that this work originated in a laboratory where scientists were encouraged to study a subject at a basic level and were not expected to have a specific goal for every set of investigations. I think this is a tremendously important point. Increasingly we find young scientists being channelled into increasingly narrow areas of activities aimed only at targets with good prospects of success. They are being given less and less room to manoeuvre. Their work is being largely confined to answering questions, ignoring the many lessons that have shown that much successful research has its origin in asking the right question. The second lesson is that it is a mistake for the scientist or the inventor to try to sell an invention by scientific and technical arguments rather than by a demonstration of how well it can fulfill the functions it claims to fulfill. The licensee is not interested in how clever the invention is; he or she merely wants to know what benefits the invention affords the designer, manufacturer, and user of the equipment in which it is incorporated. McKay A, 1976, Surprise and Enterprise ‘ Fifty Years of Science for Australia, CSIRO Publishing.